There are many times that students need to contact instructors — questions about coursework, turning in assignments, not able to attend class… it’s a long list. 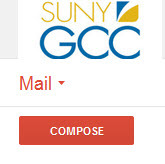 It’s useful to add your instructors to your Contacts in your Genesee Gmail account; that way you don’t have to scramble to find/remember their email address when you have questions. In your Gmail account, look for the Mail word at the top and click on it. You should get a list that includes Contacts. Click on the word Contacts. Once in the Contacts screen, click on the “add contact” icon at the top. 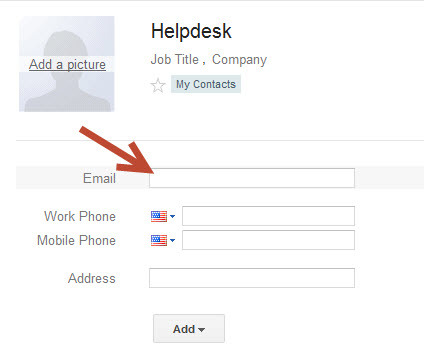 Put the name of the person you want to add to your contacts in the list and press enter. Double click on the name you just added, to get the screen to add details. Add the email address and any other information you would like to add. The information is saved automatically as you add it. 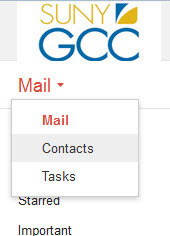 Click back on the words My Contacts to see your list of contacts. You can click on a name at any time to update the information for that person.